After our visit to Il Cimitero degli Inglesi, I read the little booklet available from the cemetery office. 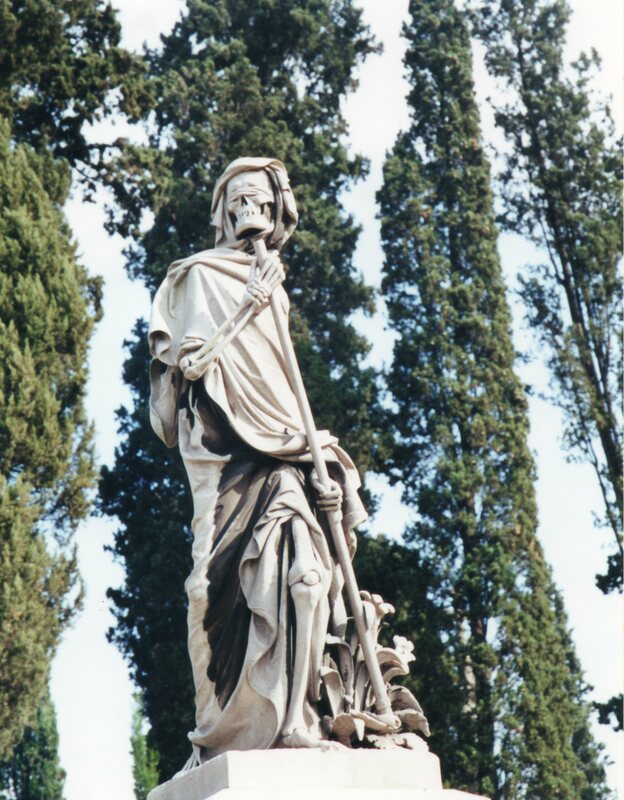 It said that many of the people buried in the “English” Cemetery were in fact Italians, who had been persecuted for their Protestant beliefs. Challenging the Pope’s authority in Italy in the 19th century had been a criminal offense, punishable by imprisonment and also refusal to be buried in sanctified ground. I wondered if the Swiss Evangelic Church had ever been allowed to bless the land of the cemetery it oversaw. In the sea of sculpture that stood on this little island of the dead, the most amazing monument marked an Italian’s grave. A larger-than-life skeleton brandished a scythe, about to slice down a clump of stone lilies. The Reaper wore his shroud like a cloak, tossed jauntily over one shoulder. The raw bones of his shin and thigh peeped out at the bottom. A rag blindfolded his eye sockets but didn’t mask his grimacing teeth. I’d never seen anything like him. I haven’t been able to discover any information about Andrea di Mariano Casentini (1855-1870), but clearly Mama and Papa had some message to give the world when they lost their child. In America, parents mark their children’s graves with teddy bears or toy cars. In the 19th century, when Casentini’s monument was created, Americans chose lambs (to connotate innocence) or broken rosebuds (to symbolize lives ended too soon). Nowhere have I seen Death, in all his glory, standing over American children. This entry was posted in Cemetery essay, Photo Challenges and tagged children's grave, English Cemetery, Florence cemetery, postaday, postaweek2012, skeletons, statuary. Bookmark the permalink. That statue is so unbelievably incredibly awesome! I want one on my grave! What a statement! It’s intense in person because it’s huge. I’m glad you like it!